The city's most exclusive and prestigious private women's social club, the Colony Club was completed in 1916 to designs by Delano & Aldrich, the architects also of the 1913 Knickerbocker Club building two blocks to the west at 2 West 62nd Street at Fifth Avenue. Both red-brick clubhouses are Georgian in style, but the Colony Club is larger and more impressively architecturally. 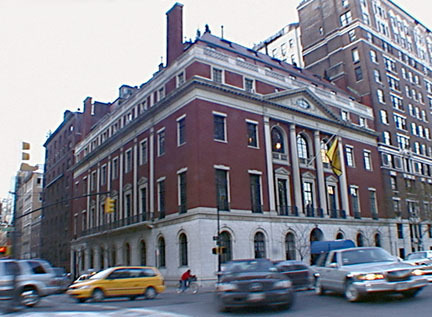 Founded in 1903, this was the earliest club in the city created just for women and its first facility was erected on Madison Avenue at 29th Street and is now the American Academy of Arts. This building has a marble base as does its neighbor to the north, the apartment house at 570 Park Avenue, shown at the right below. "This is not one of Delano & Aldrich's more elegant works in the Colonial idiom, perhaps because it was nearly impossible to create a well-proportioned design for a building with the complex spatial requirements of this club. The beautifully appointed interior included the lounges, dining rooms, and bedrooms common to social clubs, but also had a two-story ballroom, a basement swimming pool and spa that connected via an express elevator to a gymnasium on the fifth floor, two squash courts, servants' rooms (in 1925 there were thirteen female servants), and even a kennel where members could check their pets." Mr. Dolkart was more impressed with the Knickerbocker Club (see The City Review article), but others might find the Colony more refined. It is true that the interiors at the Knickerbocker Club are a bit more attractive, but the Colony offers more amenities for its members. Delano & Aldrich also designed the very handsome Third Church of Christ, Scientist at 583 Park Avenue at 63rd Street in a similar, but more flamboyant red-brick Georgian style (see The City Review article), and the very fine former residence of George F. Baker Jr., that is now the Synod of Bishops of the Russian Orthodox Church outside Russia (see The City Review article). The Colony Club was formerly located at 120 Madison Avenue between 30th and 31st Street, a 1908 structure designed by Stanford White of McKim, Mead & White, that is now the American Academy of Dramatic Arts. In his excellent book, "Park Avenue, Street of Dreams" (Athenaeum, 1990), James Trager provides the following fascinating commentary on this club"
"Its genesis was in the mind of Mrs. J. (Jefferson) Borden Harriman (née Florence Jaffray Jones), a thirty-two-year-old matron who in the summer of 1902 was obliged to leave Newport to run some errands in the city. She found the Harriman town house full of painters and plasterers, and it was unheard of for a woman to check into a hotel alone. New York had no women's club, there wee women's leagues and women's associations, but the word 'club' had connotations of something other than public service. Mrs. Harriman persuaded Mrs. John Jacob Astor, Mrs. Payne Whitney, and some other women to join her in building a clubhouse with all the comforts of the Union Club. They fixed an initiation fee of $150 and annual dues at $100, putting the colony Club on the level of the most expensive men's club, and set exclusive admission standards. Members were asked for contributions to finance construction of the clubhouse. J. P. Morgan, whose three daughters were all members, agreed to subscribe $10,000 if nine other men would do the same. 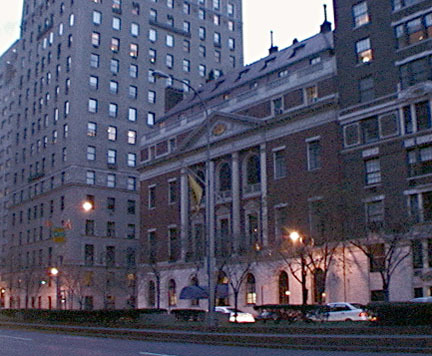 William C. Whitney offered to put up $25,000 if the women built a clubhouse as large as that of the Metropolitan Club. Stanford White was commissioned to design the clubhouse, which was smaller than the Metropolitan but seemingly quite large enough. White came to an untimely end in June 1906; the building was completed eight months laer at 120 Madison Avenue....Elsie DeWolfe (later to become Lady Mendl) interrupted her stage career to design the interiors. Mrs. Harriman, who served as president from1904 to1916, wrote in the Century magazine in 1924, 'When we were building, it was depressing to learn that the Princeton Club had put its house plans in abeyance on the ground that the Colony Club would soon fail and be for sale cheap....When I told Mr. Morgan that members of the Princeton Club hoped to take over the Colony Club when it failed, he sniffed as if he had looked into a crystal and knew that within three years after we had opened at Madison Avenue we would already be planning larger quarters and that in twelve years the house charges would show an increase of 513 percent, and would be nearly half a million dollars in 1922.' The club-house formally opened March 11, 1907....The club announced in 1914 that it would give up its Madison Avenue clubhouse for a new one that would be built as 'the finest club-house in the world.' The new house...would cost an estimated $400,000; the club obtained a $500,000 loan to cover building and land. Delayed by the war (brass window fixtures had been ordered from France and the chandeliers from Germany), the new Colony clubhouse finally opened in 1923....The red brick-and-marble Georgian-style building, apparently a four-story residence with a mansard roof, is in fact 130 feet high and filled with sybaritic luxuries quite unknown at the old club house or even at the best men's clubs. A 20' x 60' marble-and-tile swimming pool is in the basement, together with massage baths, mud baths, and sulfur baths similar to those at European spas. A special elevator links the basement with the full equipped oak-paneled gymnasium on the fifth floor and the squash courts above....Caen stone lines the walls of the Colony Club's round entrance hall, while its one-and-a-half-story high ballroom has walls with brocatelle hangings. On the second floor at two dining rooms, the library, a cardroom, and a seventy-foot-long lunge paneled in American butternut. There are forty bedrooms - and a guests' room where anxious applicants are interviewed for membership."